Jhpiego rebuilt the national midwifery education system, leading to the launch of 27 midwifery schools—a nearly four-fold increase. The re-invigorated midwifery education system has led to the graduation of more than 5,000 new midwives from these schools. As a result, the percentage of health care facilities with a trained midwife increased from under 5% in 2002 to over 85% in 2012, making lifesaving maternal health services available to many more women. 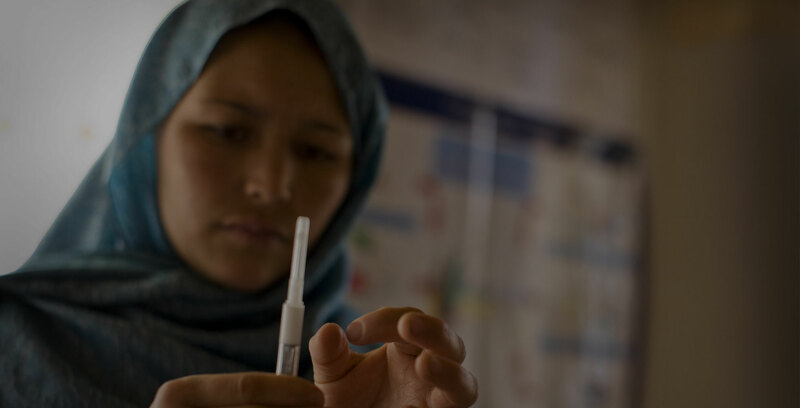 Jhpiego successfully advocated for the inclusion of contraceptive implants and sub-cutaneous contraceptive injectables (Sayana Press®) in Afghanistan’s essential drug list, resulting in expanded access and contraceptive choice. Jhpiego introduced community health worker distribution of lifesaving medicines to prevent severe bleeding and newborn umbilical cord infections after birth in women delivering at home, subsequently approved by the Ministry of Public Health. In 2018 alone, 130,000 newborns were protected against umbilical cord infection and 180,000 women were protected against severe bleeding just after delivery at home or health facility. This five-year project, funded by the U.S. Agency for International Development, seeks to increase utilization of high-quality family planning (FP) and maternal and newborn health (MNH) services in Afghanistan. It does this by introducing and scaling up gender-sensitive, culturally appropriate and cost-effective high-impact FP/MNH interventions that strengthen and enhance existing primary health care services—provided through the country’s basic package of health services, essential package of hospital services and the private sector—while also increasing demand for these services. Since October 2017, HEMAYAT has focused on reducing maternal and newborn mortality in Afghanistan’s five key population hubs: Balkh, Herat, Kabul, Kandahar and Nangarhar. These hubs account for approximately 40% of the country’s population and contain the major urban centers of the country.